A family whose son was born during the April blizzard, met one of the many heroes of their birthing saga Sunday, July 1, at the Mobridge Police Department. Mary and David Hess of Mobridge are the proud parents of five children. They adopted four, Makia Yisir, DeSalle Anthony, Carlton James and Milan Layla and were expecting their first biological child. The baby was a bit of a miracle for the couple as they thought they were unable to have children. Mary went into labor a week early and the couple headed to Mobridge Regional Hospital where the couple waited for the birth of child. It was later in the day when the few flakes of snow that fell as they arrived turned into a raging spring blizzard in the area. Criston Hess was born, with the help of nurse practitioner and midwife Dori Vojta, and Dr. Robert Marciano, in the later evening of April 2, weighing in at 7 pounds, 10 ounces. The birth itself was uneventful and the baby was healthy. According to a written account of the saga presented to the MPD from the Hess family, Mary suffered complications after the birth and lost a lot of blood. She became faint and the medical personnel knew they had to take steps to save Mary’s life. Mary was rushed into surgery to attempt to stop the bleeding. Dr. Matthew Schaffer was called in to close off some of the blood vessels supplying the uterus. Mary had a serious form of retained placenta called placenta accrete and was hemorrhaging. The bleeding could not be stopped completely despite their effort in the operating room. To make matters worse, Mary has O negative blood, which is rare. Two units were all there were on hand at MRH&P. With all hands on deck, the medical staff at MRH made the decision to send Mary to Bismarck where she could receive more specialized care. But the storm, now in full force, kept ambulances off the roads and medical aircraft from landing in Mobridge. The urgent call for assistance went out and several people risked their own lives to bring the O negative blood, needed to save Mary’s life to MRH&C. One of those people was Mobridge Police Officer Nick Bratland. He was in the office when the third aircraft bringing blood to Mary was turned away because of weather. He said he could hear in the voice of the E911 dispatcher the seriousness of the situation. He said dispatchers are trained to report every situation with the same even calmness. But he said he knew what needed to be done through her voice. Bratland jumped into the department’s Chevrolet Tahoe and headed to meet a deputy coming east from Bowdle with several units of blood. He doesn’t remember how much time was spent on the road, but says there were whiteout conditions, packed and slippery roads and he was tackling snowdrifts that he normally would not attempt to go through. Bratland said he waited for nearly 45 minutes at the south junction of U.S. Highways 83 and 12 for the other officer to arrive with the blood before he decided Mary could wait no longer. He turned the Tahoe to the east and began the second leg of his trip to Bowdle. He said the whiteout was complete and the drifts were higher than before as he pushed the Tahoe through the storm. He can’t remember how long it took him to get back from Bowdle, but Bratland arrived at MRH&C with the life-saving blood. He met David Hess in the hallway and said the new father thanked him many times in the short time they spoke. Bratland said the staff was thanking him but he said they were the real heroes in this situation. They saved Mary’s life. Bratland was not alone in his efforts to bring blood to MRH&C through the ferocity of the storm. Several other emergency personal arrived with units of blood for Mary, all braving the storm to help save the life of the mother of five children. As the weather cleared enough to get an airplane on the ground at Mobridge Regional Airport, where a crew had been keeping the runways clear in the heart of the storm, Mary was transported to Bismarck, where she received the specialized care that she needed. But for Bratland and the other emergency personal in the area, it was night they would remember and repeat if necessary. He explained it that way to his chief, Shawn Madison, the next day. 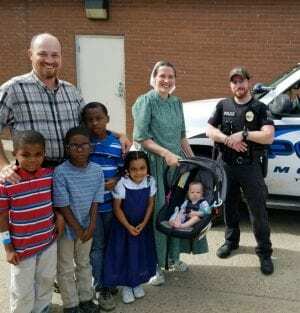 On July 1, David and Mary, with their five children in tow, surprised Bratland at the law enforcement center. They shared their story with the officer and thanked him for his role in helping Mary through her ordeal. They said their faith, the prayers of others and the professional involved brought her through. Bratland agrees with their assessment.